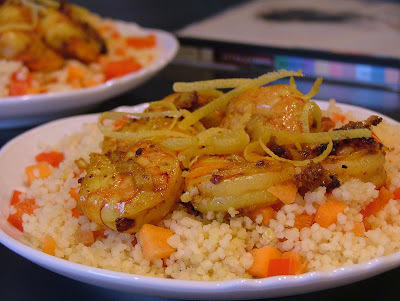 This week I set out on a mystical cooking journey as I prepared this spiced shrimp and lemon couscous dish while listening to the powerful sounds of Peter Gabriel’s Passion CD. The songs on this CD certainly don't have a "relaxed" feel to them. If you're cooking after a stressful day at work, this isn’t the best choice. However this intense soundtrack works if you are in the mood to be swept away to an exotic foreign land where adventure awaits. This dish encompasses many of the same qualities as the music with its powerful flavors. Ingredients such as curry powder, ground cinnamon and couscous add a sense of adventure, especially to those who wouldn’t typically use them in their cooking. But don’t let this prevent you from venturing into making this dish. Discovering new flavors can be as exciting as traveling to new destinations! 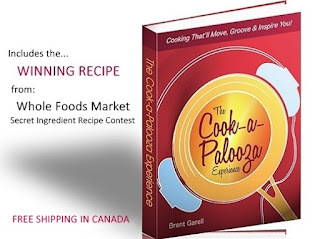 Its scent is powerful (I suggest turning on your cooking fan) and so are the wonderful savory flavors that goes along with it! Served on a bed of couscous it makes for a light meal you may encounter the next time you set out on an unforgettable journey to a distant land. In a medium bowl combine oil, onion, curry powder, ginger, vinegar, honey, cinnamon and hot sauce. Add shrimp. Toss to coat. Heat a large nonstick skillet over medium-high heat. Add shrimp and marinade. Cook until shrimp are just cooked through, about 3 minutes. Remove shrimp from skillet. Cover shrimp to keep warm. Set aside. Add broth to skillet. 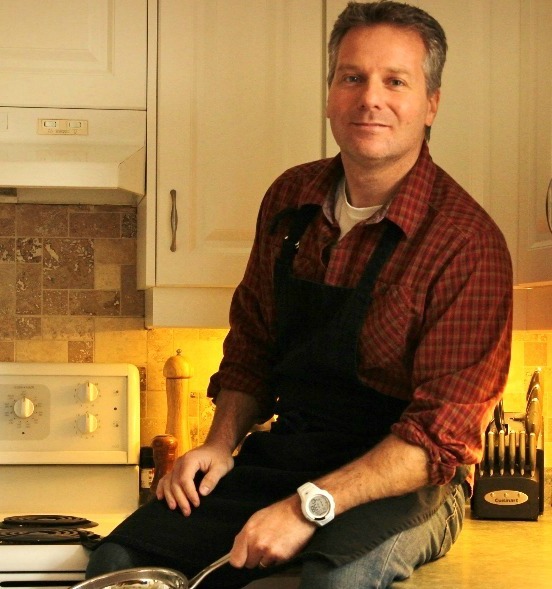 Scrape up any brown bits at the bottom of the skillet with a wooden spoon. Tranfer broth to a medium saucepan. Bring vegetable broth to a boil, over medium heat. Remove from heat and stir in couscous. Cover and let stand for 5 minutes. Using a fork, stir couscous to break up any clumps. Stir in carrots, red peppers, lemon zest and cilantro. Season with salt and pepper. 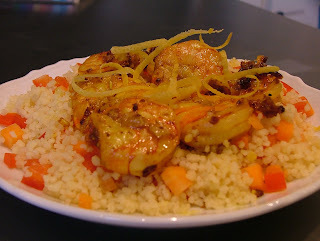 Transfer couscous mixture to a serving dish and top with cooked shrimp.